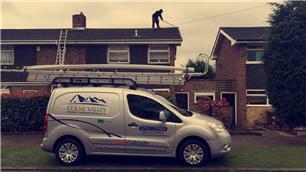 Colne Valley Home Improvements - Driveways/Patios/Paths, Fascia/Soffits/Guttering, Roofer based in Horton, Berkshire. At Colne Valley Home Improvements we cater for a wide range of high quality home improvement solutions. Our services are available to domestic customers of all size projects as well as requirements; and cover a wide range of areas, from roofing services through to power/jet cleaning, and patio installations. We have many years of home improvement expertise, and a reputation for expert craftsmanship and first class service throughout any work undertaken by us. We pride ourselves on our comprehensive communication skills with our clients, and we'll keep you informed every step of the way through work being carried out at you premises. Based in Slough, Colne Valley Home Improvements cover a wide radius including; Slough, Berkshire, Surrey and Buckinghamshire. Our core belief is to always deliver quality workmanship and a friendly attitude at a price that's right. We also provide free quotations and all our work is guaranteed. This ensures that you know you’re working with the right team and your project is in safe hands. Contact Colne Valley Home Improvements today to find out what we can do for you.